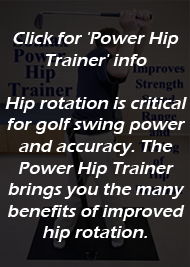 "By increasing the strength and speed of hip rotation in golfers, the Power Hip Trainer reduces casting and increases lag during the downswing." Somax Performance Institute (web: swing-speed.com), the world leader in analyzing, measuring and improving golf swing mechanics, has recently found that videos of golfers taken before and after they start using the Somax Power Hip Trainer show that they reduce casting and increase the lag of their clubs during their downswing. Conventional instruction tries to reduce casting and increase lag by holding the club back with the hands and wrists. The new videos, on the other hand, show that casting is the result of slow hip rotation. By providing resistance to hip rotation with its special, high tensile strength spring, the Somax Power Hip Trainer enables golfers to effortlessly increase their hip speed and thereby reduce casting and increase lag. "Casting is really the result of golfers trying to make up for slow hip rotation by increasing the effort of the hands and arms" says Bob Prichard, Director of Somax Performance Institute. "Since not much power is generated with slow hip rotation, golfers compensate by over-contracting the muscles of the forearms, which leads to casting. 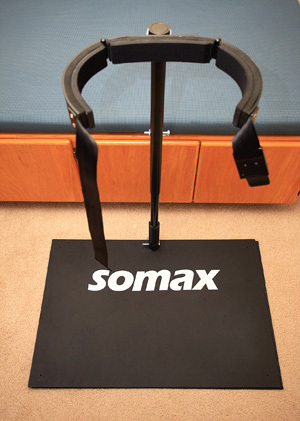 The Somax Power Hip Trainer provides the resistance needed to increase the strength and speed of hip rotation during the golf swing. The result is that golfers can relax their forearm, which decreases casting, and increases lag—and which adds more distance with all their clubs. 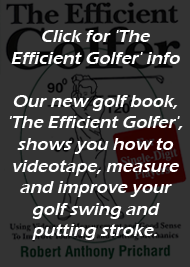 Golfers who have trained on the Power Hip Trainer for a month or more report adding 30-50 yards off the tee and are 1-2 clubs longer in their irons." The Somax Power Hip Trainer is the only all-steel aerobic exercise machine to increase the strength and speed of hip rotation for golf. The Somax Power Hip Trainer adds speed, but also improves control by transferring work of powering the club from the small forearm muscles to the much larger hip rotation muscles, enabling the golfer to use his arms primarily to control the swing plane and club face. Golfers who purchase the Somax Power Hip Trainer receive weekly helpful hints to get the most out of their new aerobic exercise machine. A padded steel hip cinch with 2" wide nylon belt to adapt to different hip sizes. All parts are finished with baked-on black enamel paint for years of maintenance-free use. A DVD containing 26 drills for both right and left-handed golfers. Golfers receive weekly emails containing helpful hints to get the maximum increase in hip speed with their new Power Hip Trainer.